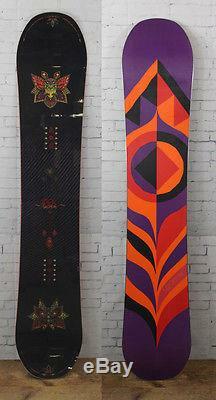 For sale is a new display 2016 Salomon Idol Womens Snowboard in size 148 cm. This is our display board. The Salomon Women's Idol Snowboard has the performance needed to completely dominate every bit of rideable terrain on the mountain. Features: Rocker Type - Cross Profile - Salomon's Cross Profile consists of camber between the feet for better control, pop, and landing stability and Rocker on the tip and tail for effortless flotation both forward and switch. Shape - Directional Twin - A twin shape for all freestyle terrain, with a directional flex for power at high-speed and a stance that is slightly set back Quadratic Sidecut - A blend of elliptic curves for easy turn initiation, effortless direction changes and fluid edge to edge transitions Core - Ghost Green - To build this light and poppy core, Salomon mixed their best wood strips with some carefully selected sustainable light wood. Popster - Popster technology maximizes the natural snap and powerful pop of wood with Popster's shaped core profile, creating the feeling like your skateboard kicktail finally connected with your snowboard. Laminates - BA MD - Medium density European-made fiberglass layers for a guaranteed consistency of quality on light and lively boards GHOST Basalt Stringers - Basalt stringers are sewn into a triax layer for durable pop, control, and a damp ride at high speeds and aids in easy maneuverability when you're keeping it mellow. Sidewalls - ABC Green Roll - The snap of bamboo, the comfortable ride of cork sidewalls, and the bombproof strength of basalt - ABC Green Roll (Advanced Bamboo Construction) blends natural materials into a supernatural snowboard for more pop and less plastic. Base - Sintered EG - Salomon has engineered this base for a super fast glide on everything from fresh pow to sticky spring snow. A sintered base material provides superior wax retention while Gallium strengthens impact resistance and the Electra finish gives a turbo-charged glide. Fine Stone Finish - Salomon's fine stone finish is particularly efficient on their Sintered EG base - hit the gas in powder or softer snow conditions. Edges - All Mountain Edge Bevel - Salomon detuned the tip and tail to a 1 degree edge holding tune throughout the key parts of the sidecut, and back to a 2 degree bevel between the feet delivering a solid edge hold with no hang-ups. Royal Cork Rails - Protect the planet and your edges with this eco version of Royal Rubber. Royal Rubber Rails protect your edges from blowouts with a thicker and softer rubber that absorbs impacts and reduces chatter while you ride. Waist Width: 23.9 cm. Doing that is against U. Please verify that this is correct. Powered by SixBit's eCommerce Solution. The item "New 2016 Salomon Idol Women's Snowboard 148 cm Cross Profile Camber" is in sale since Tuesday, September 1, 2015. This item is in the category "Sporting Goods\Winter Sports\Snowboarding\Snowboards". The seller is "gckcjinvt" and is located in North Clarendon, Vermont. This item can be shipped to United States, Canada, United Kingdom, Denmark, Romania, Slovakia, Bulgaria, Czech republic, Finland, Hungary, Latvia, Lithuania, Malta, Estonia, Australia, Greece, Portugal, Cyprus, Slovenia, Japan, Sweden, South Korea, Indonesia, Taiwan, Thailand, Belgium, France, Hong Kong, Ireland, Netherlands, Poland, Spain, Italy, Germany, Austria, Israel, Mexico, New Zealand, Philippines, Singapore, Switzerland, Norway, Saudi arabia, Ukraine, United arab emirates, Qatar, Kuwait, Bahrain, Croatia, Malaysia, Brazil, Chile, Colombia, Costa rica, Panama, Trinidad and tobago, Guatemala, Honduras, Jamaica.